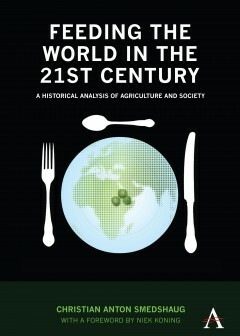 'Feeding The World in the 21st Century: A Historical Analysis of Agriculture and Society' provides and utilizes a historical understanding of the current global food situation as the basis for analyzing the ultimate challenge on how to feed an ever-expanding world of 10 billion people. 'Feeding The World in the 21st Century: A Historical Analysis of Agriculture and Society' provides a historical understanding of agricultural development over the last two centuries. Characteristics of the period have included the opening of the prairies in the late 18th century, the invention of industrial fertilizer and the tractor's displacement of the horse. Such profound developments have led to an abundance of food and peace and prosperity within the world market. This situation began at the end of the American Civil War and continued until 2005, when prices rose in spite of increased production. Smedshaug gives a historical background of the current situation, while discussing the ultimate challenge of how to feed a world of 10 billion people. This challenge has to be met in the light of climate change, water shortage, and not least the declining availability of fossil fuel. Smedshaug's analysis and recommendations underline the need for every country to have the freedom to establish an agricultural policy adapted to the given national natural conditions, as well as the need to put the producer at the heart of the policy in such a way that all countries can utilize their potential to produce food, and hence to feed the world. Christian Anton Smedshaug worked with agricultural policy as related to the Organization for Economic Cooperation and Development (OECD) and the World Trade Organization (WTO) in the Norwegian Ministry of Agriculture from 2001 to 2003. From 2003 onwards, he has worked with the Norwegian Farmers Union on issues of agriculture, trade and development in the political context of the EU and WTO. He was awarded a PhD from the Norwegian Agricultural University in 2000. Niek Koning is currently Assistant Professor of the Agricultural Economics and Rural Policy Group at Wageningen University, the Netherlands, where his research topics include long-term evolution of the agri-food sector in developed countries, and agrarian institutions and politics.